Although packed with health benefits but astringent, sour and bitter to taste, this fruit does not fit into everyone’s diet. 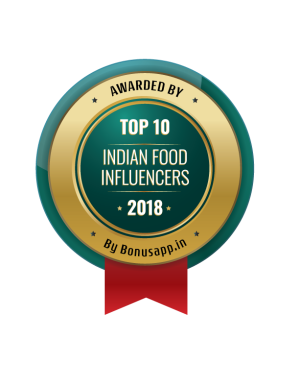 Amla powder, amla juice and amla pickle and murabba (preserve) are some of the few ways that people try and incorporate this powerful superfood in their diet. Not so loved produce but very popular among the healthy conscious, this humble fruit increases immunity, slows down ageing, reduces blood sugar, increases metabolism, purifies blood, helps fight common cold, improves eye sight. Besides many other vitamins and minerals, it contains eight times the Vit C found in your regular orange. Wash and dry the amla. Put them inside a ziplock bag. Flatten them out in a single layer and keep them in the freezer for five to six days, depending on the size of the amla. 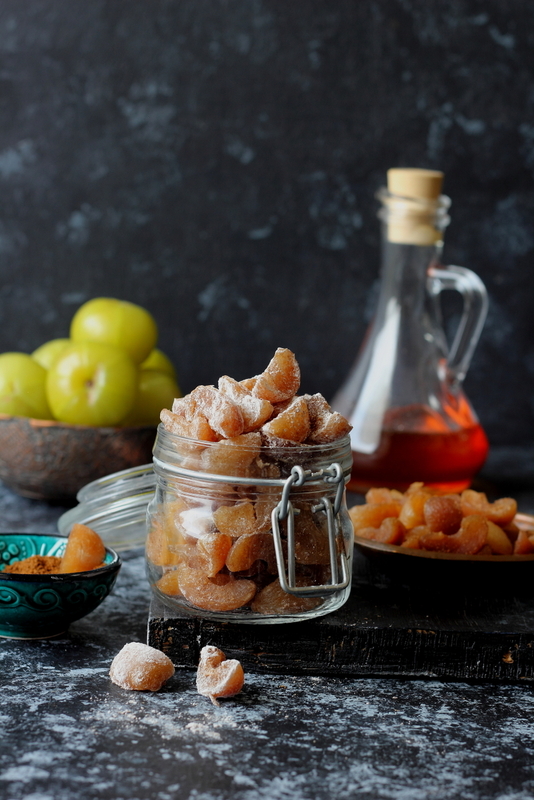 Remove the amla from the freezer and allow them to sit till they soften. 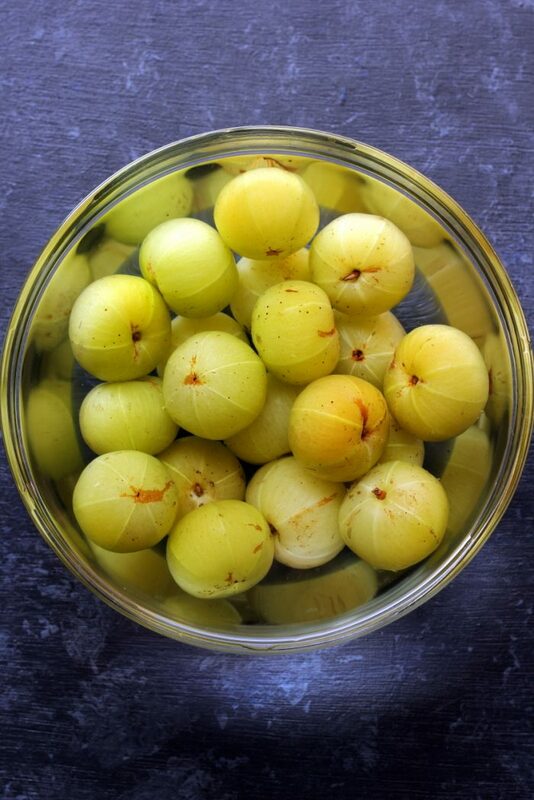 The amla slices will come off easily by scoring or running your knife along the natural segment line of amla. This process should take you 20 minutes approx. 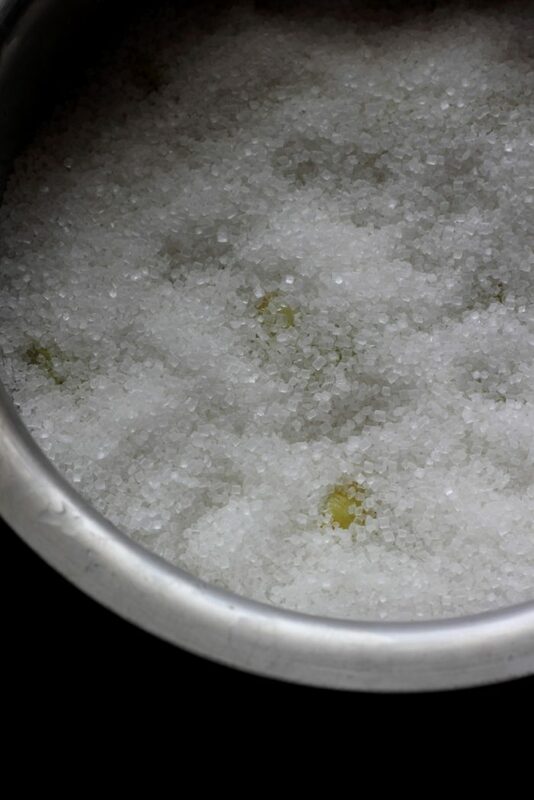 Once this process is over, transfer the pieces to a glass mixing bowl or a non corrosive pot (I used steel pot) and sprinkle the sugar all over it so that the amlas are completely covered by the sugar. Cover with a lid and set aside at a place where no ants can reach. 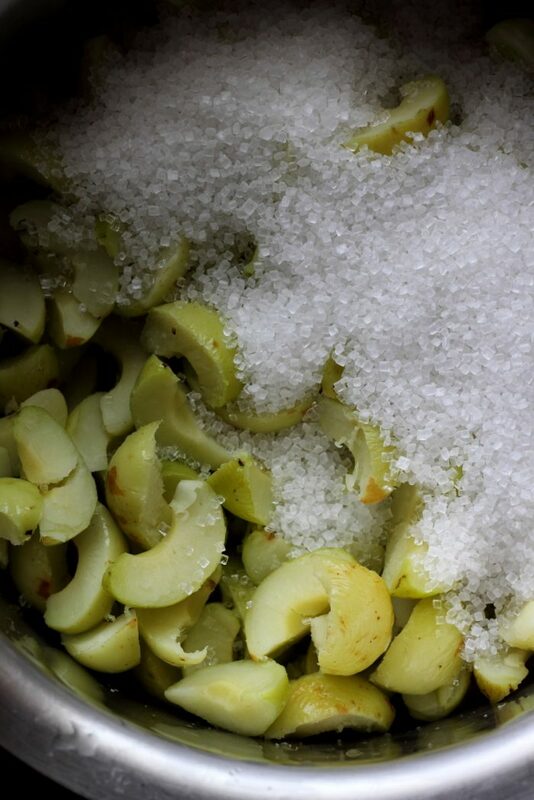 The sugar will take 2 – 3 days to melt (depending on the size of the amla). After 24 hours, stir the pieces around using a spoon or spatula and again cover & keep aside. After three days, the sugar will completely dissolve and the pieces are ready to be removed from the syrup. Remove excess liquid by passing it through a strainer. Keep them in the strainer for 15 – 20 minutes to ensure that the syrup is well drained. Reserved the syrup. 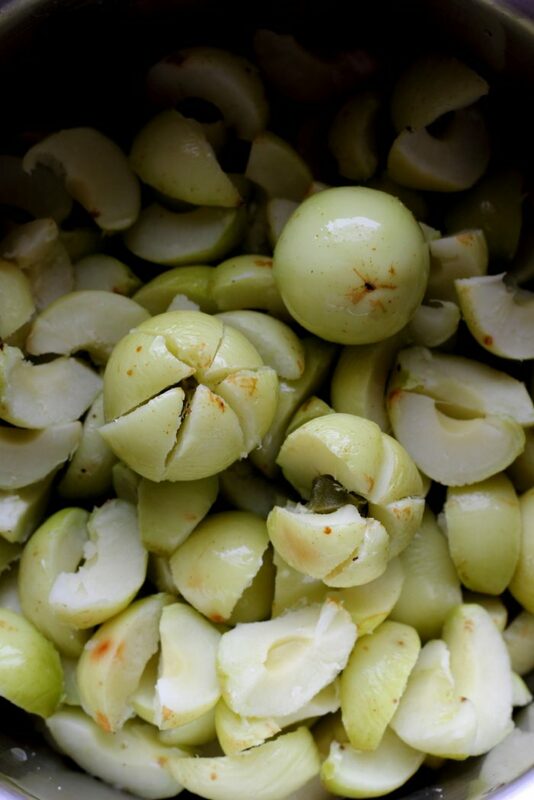 Once the amla pieces have dried and are no longer sticky, they ready to be dredged with spices and icing sugar. The sun dried pieces will wear a discolored look but that is fine. 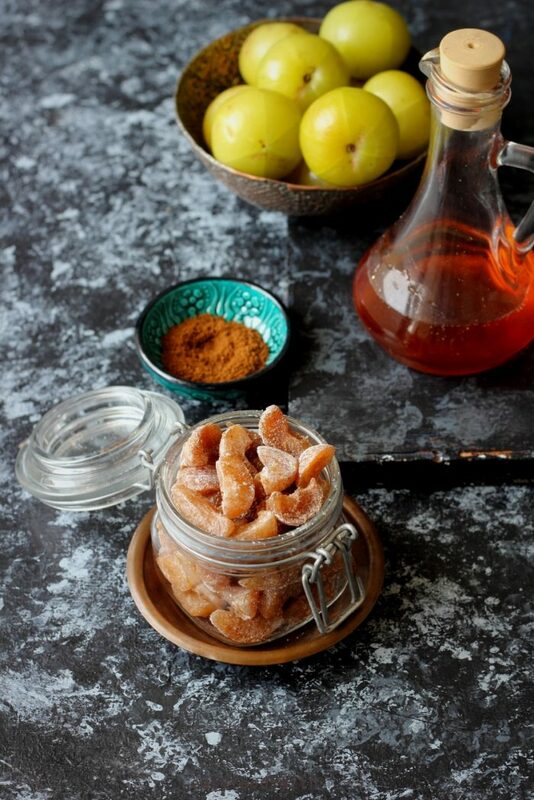 Transfer the amla pieces to a clean and dry mixing bowl and sprinkle the ground spices over it. 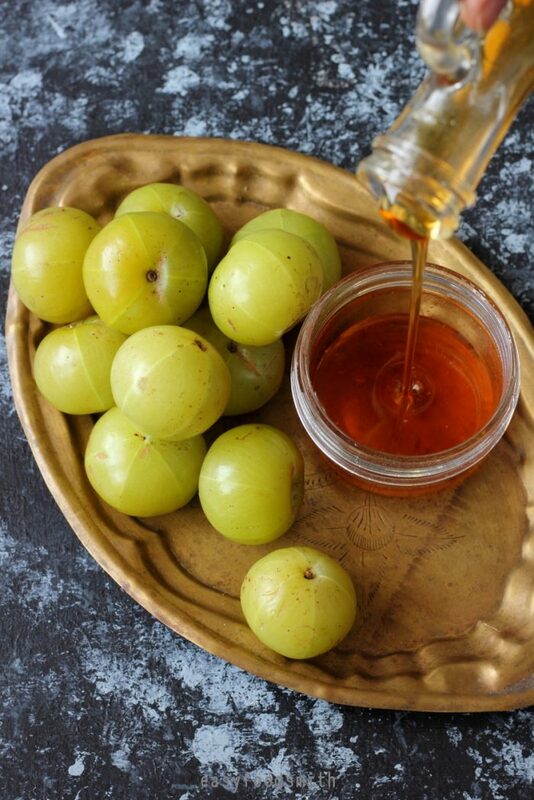 Ensure that each and every slice of the amla is well coated. Next, dust over / sprinkle the icing sugar, using a sieve (to avoid sugar lumps). Use as much as needed. I used just enough to cover them. Shake the candies inside the bowl to ensure that each and every piece is well coated with the spice mix and icing sugar. 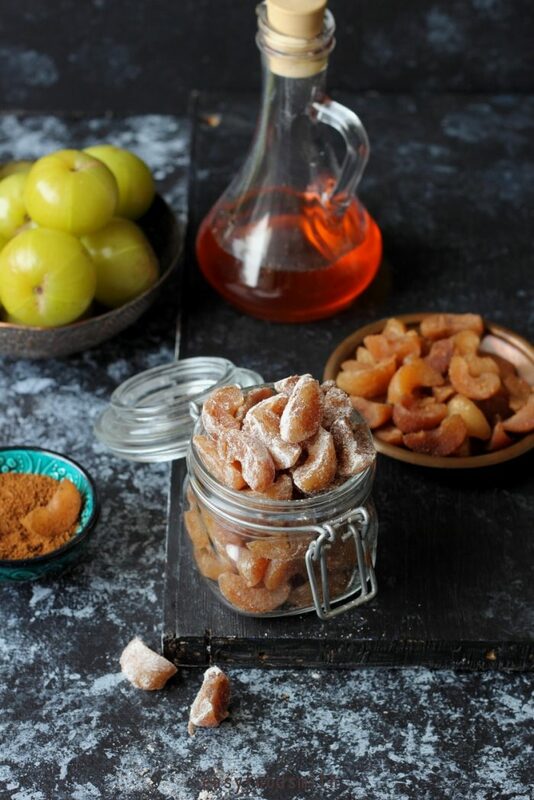 Remove the amla candy in an air tight container. The candy should stay well for six months. And for the liquid that we had reserved, after soaking the amla in sugar, you can turn it into a syrup and store it in a bottle. Use it as a concentrate. 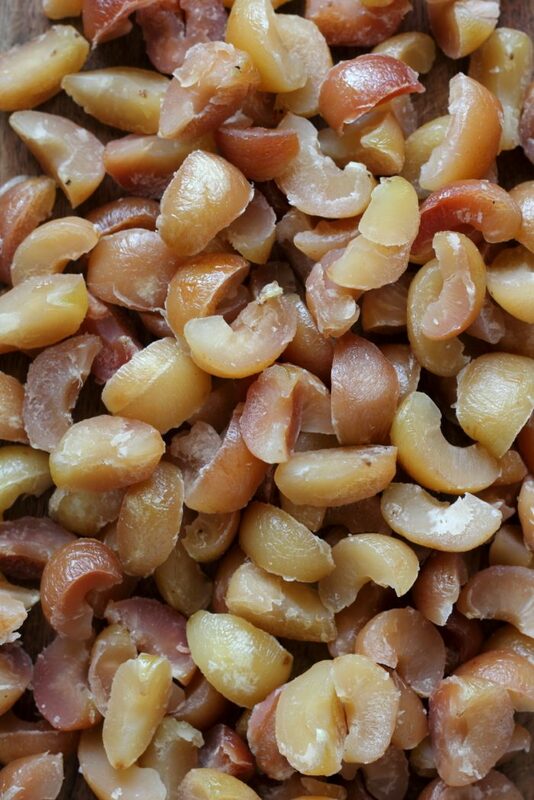 You can swap sugar with jaggery. 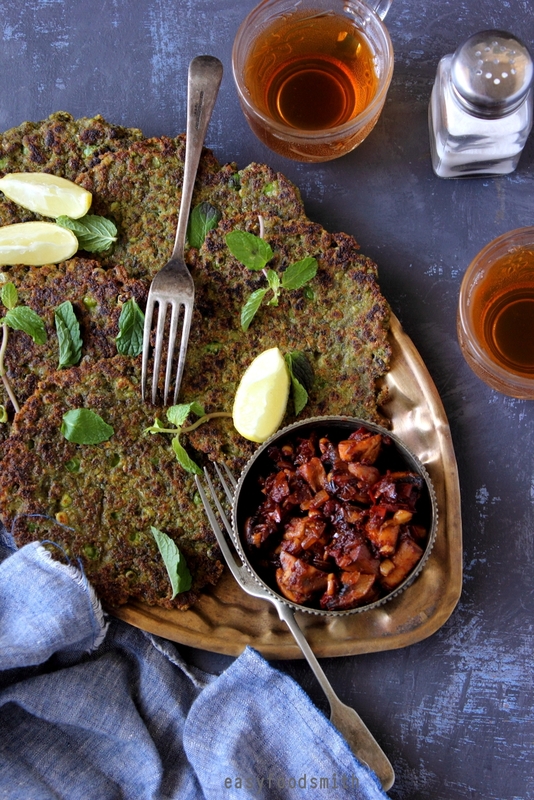 Use equal weight of both amla and jaggery. 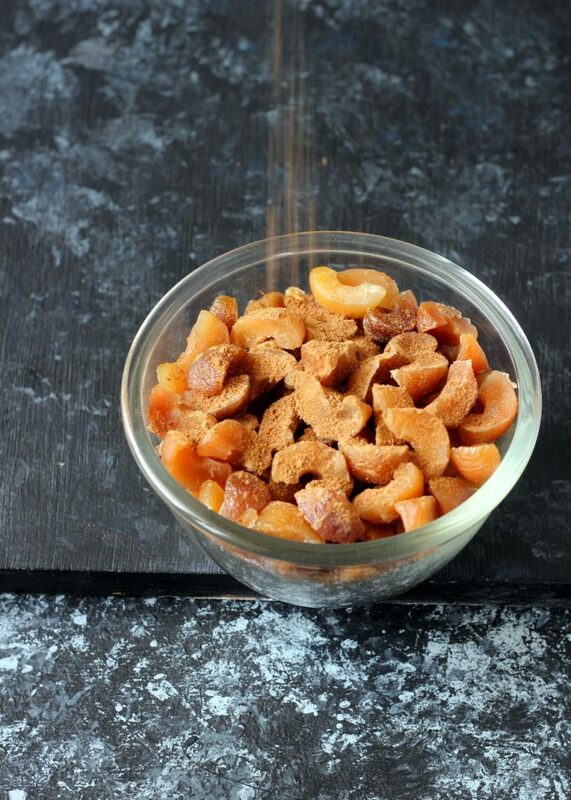 You need to follow the same procedure except that while using jaggery you need to layer the jaggery and amla alternately before you leave them for soaking. Also ensure that you grate the jaggery to ensure smooth assimilation and dissolving. Thanks for visiting and see you soon again with another exciting recipe. Had lots of those berries when I was still a kid. My mom sometimes made preserves with honey and used it against throat sore. 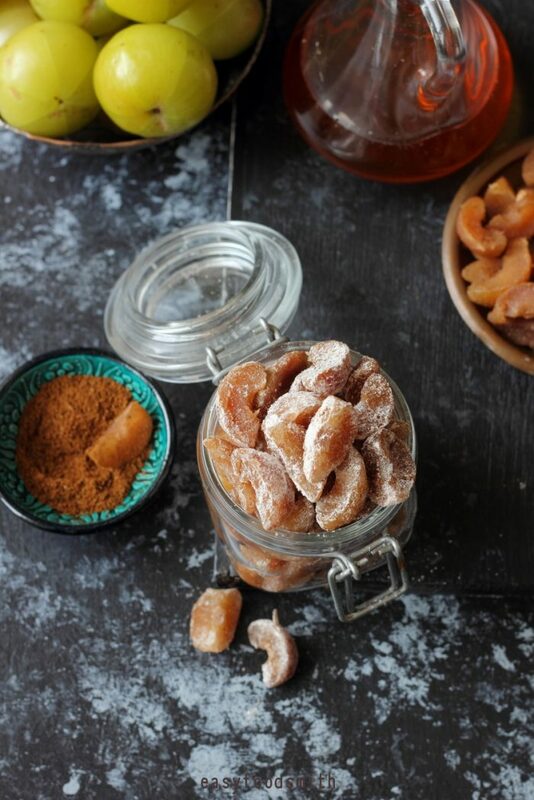 Yours spiced candies look marvelous! I’ve never had these — sounds really interesting. 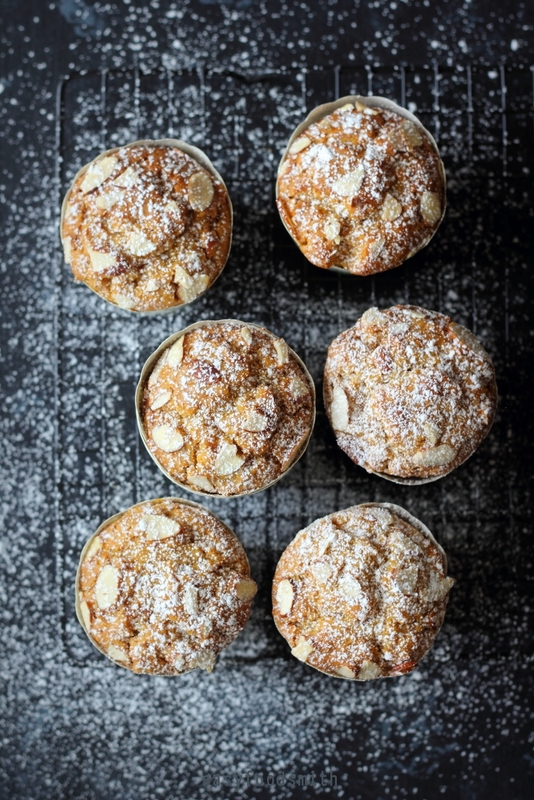 Fun recipe, terrific photos. Thanks! I don’t know what half of these ingredients are but the candies looks delightful! Need to do some research. Thanks!